Toronto Maple Leafs left winger James van Riemsdyk congratulates goaltender Frederik Andersen after beating the Nashville Predators in Toronto on Wednesday, February 7, 2018. Frederik Andersen pushed his way into the Vézina Trophy conversation this week, but he would rather not talk about it. "I have more important things to do. 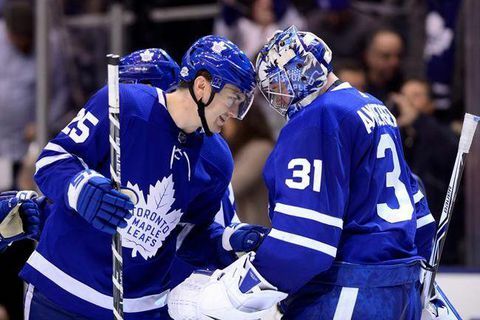 We have a lot of work ahead of us," the Toronto Maple Leafs goaltender said on Friday when his name came up as a contender for the award handed out in June to the NHL's best goalie. But his teammates are not as bashful. After all, going into Saturday night's game at Air Canada Centre against the Ottawa Senators, the Leafs have won six of their past seven games. In each one of those games, Andersen was a central figure. Leafs centre Tyler Bozak even advised some reporters to pass along video evidence to the NHL's 31 general managers, who do the voting for the Vézina. "You watch that game against Nashville," he said. "Show 'em that tape and that should put him in the conversation right there. We're lucky to have him. He gives us a chance to win every night." Bozak was talking about Wednesday night's 3-2 shootout win over the Nashville Predators. Andersen made 44 saves in regulation time and faced down six of seven Predators in the shootout to win the game for the Leafs. It was just the latest display of wizardry for the 28-year-old native of Herning, Denmark. He made several game-saving stops in regulation and then, after the Leafs went one-up in the shootout, stoned the Preds' seventh shooter, Viktor Arvidsson, to get the win. Andersen's statistics are not an obvious advertisement for his Vézina campaign for the most part. He was tied for ninth in the NHL in save-percentage at .922 before Friday night's games and 17th in goals-against average at 2.64 for goaltenders who played at least 18 games. His 26 wins were fifth in the league. However, no goaltender saw more pucks than Andersen by Friday's games. He faced 1,551 shots in 46 games, 135 more than second-place Mike Smith of the Calgary Flames. Andersen also played more than any other goaltender with almost 2,751 minutes on the ice. At 5-1 this season, there is no one better than Andersen at shootouts. This is a 180-degree reversal from not only last season but from most previous seasons, as the Leafs historically have not fared well at the skills competition that decides regular-season overtime games. In 2016-17, Andersen's first as the Leafs' No. 1 goaltender, the Leafs were 1-8 in the shootout. Andersen says his improvement in the shootout is tied to his overall improvement as a goaltender: picking his spots against shooters and not over-thinking the position. "I'm trying to be aggressive and patient at the same time," he said. "Sometimes those things can freeze you up a little too much. Once you start thinking, you'll be off your game. It goes for the regular game, too. You don't think so much, you play." Over all, Andersen says, he does not place much value in statistics. They can deceive you into thinking you are better or worse than you are actually playing. "I look at goals-against and saves," he said. "Would I have done something different or would I have stayed with what I was trying to do in that situation? There can be a game where you see 15 shots and three goals where you wouldn't have done anything different on the three goals. "The only difference would be if you had 35 saves and 20 shots you had maybe right in the gut and had some easy saves there. You could have been [mislead about] those stats a bit." Leafs head coach Mike Babcock does not want anyone, especially his players, thinking shootout success means a lot in the big picture. After all, there is no shootout in the playoffs. But he does see Andersen following the same pattern as all successful players. "The big thing about good goaltending is you play with good teams," Babcock said. "The next thing I'd say is they have a way to bring it every day in practice and in games. When things are going good for them they don't relax and get comfortable, they just keep trying to get better. "That's the key to anybody that's real good at their craft. They have a thirst for knowledge and a thirst for getting better and a thirst for being the best and they're not easily satisfied. As soon as you relax and get feeling good about yourself it usually gets ugly." The odd thing is, Andersen does not come across as a driven, type-A personality. He speaks so softly it is often difficult to hear him in media scrums and he appears as laid-back as someone's favourite lounge chair. But there is a sly sense of humour in there. "I think as a goalie, to be calm like that is a good thing," Bozak said. "He's always calm in the net and pretty calm off the ice. He stays on an even keel. "He's got a great sense of humour; he's fun to be around. We live pretty close to each other so we drive together. He's opened up to me. He was probably a little quieter at the start. He likes to pick on some guys with me and vice versa, pick on each other. He takes jokes really well." Andersen gives Leafs goaltenders coach Steve Briere a lot of credit for his improvement as well. "We work hard every day and be sure we're prepared for the next opponent," he said. "That's an ongoing effort. He does his homework better than anyone. We're building a really good relationship, making sure I'm ready."